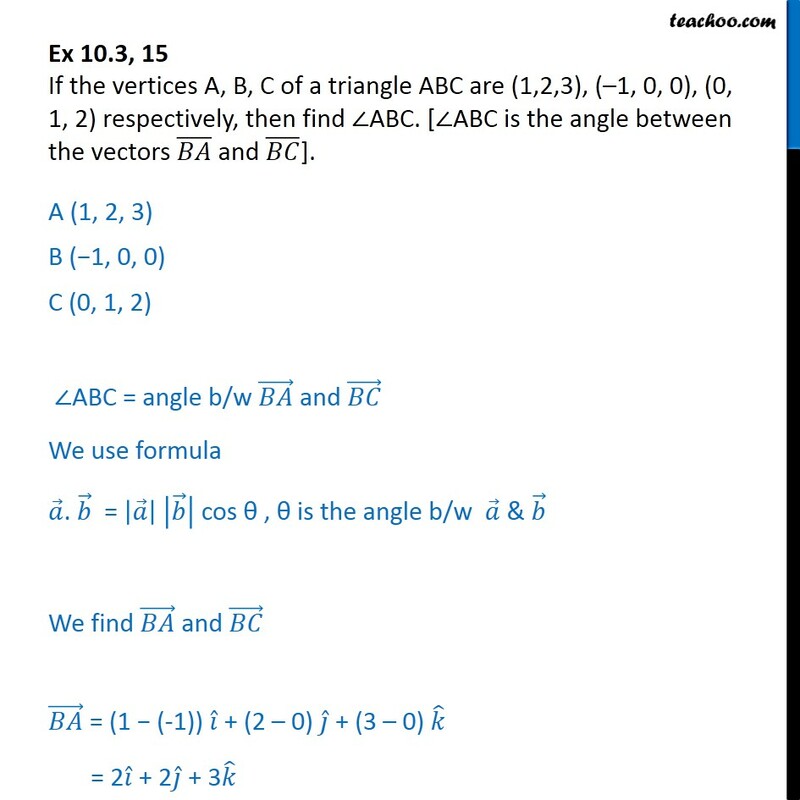 Ex 10.3, 15 (Introduction) If the vertices A, B, C of a triangle ABC are (1,2,3), (–1, 0, 0), (0, 1, 2) respectively, then find ∠ABC. [∠ABC is the angle between the vectors 𝐵𝐴﷯ and 𝐵𝐶﷯]. 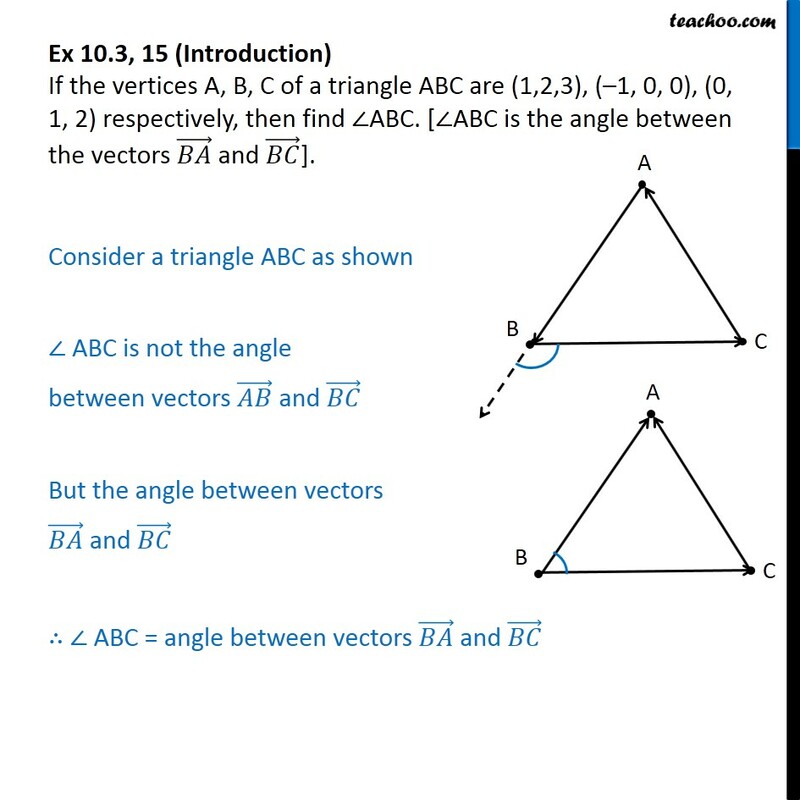 Consider a triangle ABC as shown ∠ ABC is not the angle between vectors 𝐴𝐵﷯ and 𝐵𝐶﷯ But the angle between vectors 𝐵𝐴﷯ and 𝐵𝐶﷯ ∴ ∠ ABC = angle between vectors 𝐵𝐴﷯ and 𝐵𝐶﷯ Ex 10.3, 15 If the vertices A, B, C of a triangle ABC are (1,2,3), (–1, 0, 0), (0, 1, 2) respectively, then find ∠ABC. [∠ABC is the angle between the vectors 𝐵𝐴﷯ and 𝐵𝐶﷯]. 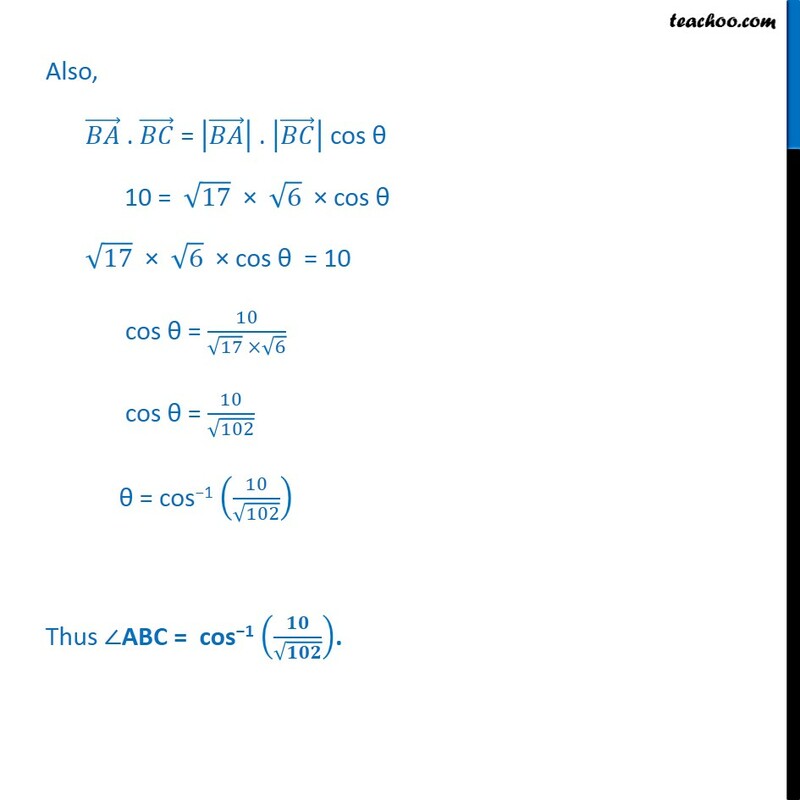 A (1, 2, 3) B (−1, 0, 0) C (0, 1, 2) ∠ABC = angle b/w 𝐵𝐴﷯ and 𝐵𝐶﷯ We use formula 𝑎﷯. 𝑏﷯ = 𝑎﷯﷯ 𝑏﷯﷯ cos θ , θ is the angle b/w 𝑎﷯ & 𝑏﷯ We find 𝐵𝐴﷯ and 𝐵𝐶﷯ 𝐵𝐴﷯ = (1 − (-1)) 𝑖﷯ + (2 – 0) 𝑗﷯ + (3 – 0) 𝑘﷯ = 2 𝑖﷯ + 2 𝑗﷯ + 3 𝑘﷯ 𝐵𝐶﷯ = (0 − (−1)) 𝑖﷯ + (1 − 0) 𝑗﷯ + (2 − 0) 𝑘﷯ = 1 𝑖﷯ + 1 𝑗﷯ + 2 𝑘﷯ Now, 𝑩𝑨﷯ . 𝑩𝑪﷯ = (2 𝑖﷯ + 2 𝑗﷯ + 3 𝑘﷯) . 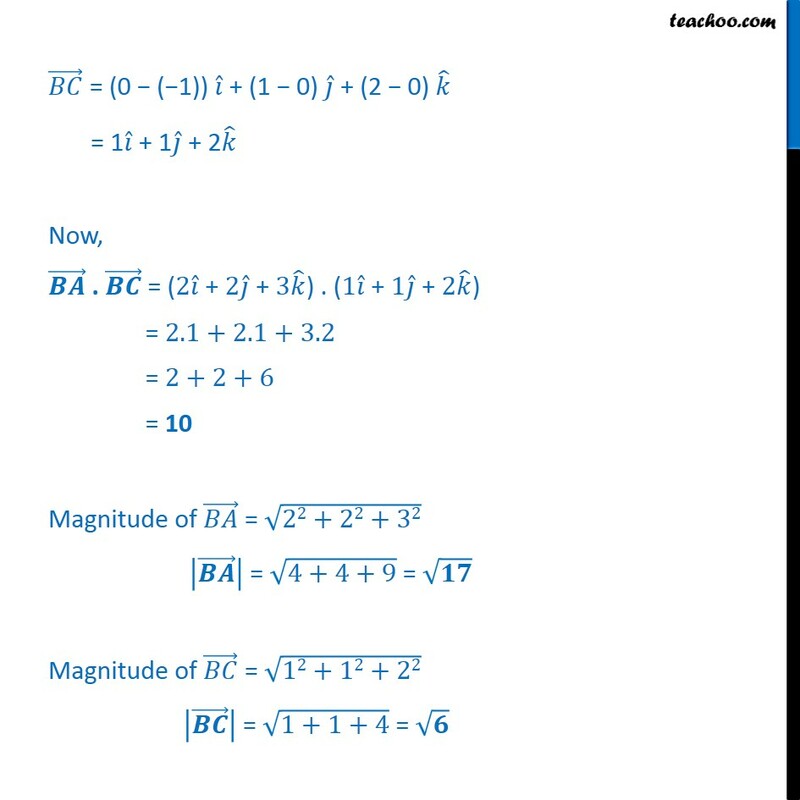 (1 𝑖﷯ + 1 𝑗﷯ + 2 𝑘﷯) = 2.1+2.1+3.2 = 2+2+6 = 10 Magnitude of 𝐵𝐴﷯ = ﷮22+22+32﷯ 𝑩𝑨﷯﷯ = ﷮4+4+9﷯ = ﷮𝟏𝟕﷯ Magnitude of 𝐵𝐶﷯ = ﷮12+12+22﷯ 𝑩𝑪﷯﷯ = ﷮1+1+4﷯ = ﷮𝟔﷯ Also, 𝐵𝐴﷯ . 𝐵𝐶﷯ = 𝐵𝐴﷯﷯ . 𝐵𝐶﷯﷯ cos θ 10 = ﷮17﷯ × ﷮6﷯ × cos θ ﷮17﷯ × ﷮6﷯ × cos θ = 10 cos θ = 10﷮ ﷮17﷯ × ﷮6﷯﷯ cos θ = 10﷮ ﷮102﷯﷯ θ = cos−1 10﷮ ﷮102﷯﷯﷯ Thus ∠ABC = cos−1 𝟏𝟎﷮ ﷮𝟏𝟎𝟐﷯﷯﷯.